The Emperor of the Sea slot machine is creative, and it certainly has features that players are going to find rather riveting. The Oriental aquatic theme on the other hand isn’t original at all and makes us crave for something revolutionary and exciting. Microgaming’s Emperor of the Sea slot machine takes us back to Ancient China. Like in so many other video slots, China is the big theme of the day. In the Emperor of the Sea slot, we’ve got the same old symbols we’ve seen before, we’ve got generic and standard features, but original and creative prizes and wagers. There’s something for everyone, as you’ll discover in our Emperor of the Sea slot review. There isn’t too much original about the Emperor of the Sea video slot’s graphics. We’ve seen them all before, and we’re sure that you have too. Expect to find golden ingots, jade vases, turtles, ships, Koi fish, dragons and all your customary Far Eastern imagery in the Emperor of the Sea online slot machine game. These symbols have been drawn in a more traditional and inventive way, but the basic premise is the still the same as we’ve seen time and time again. With the Emperor of the Sea RTP rate fixed at 97%, there are plenty of wins to be had in this slot. Where the Emperor of the Sea game does excel is with its wagering range. Players will find that they can opt to play with either 38, 68, or 88 paylines. 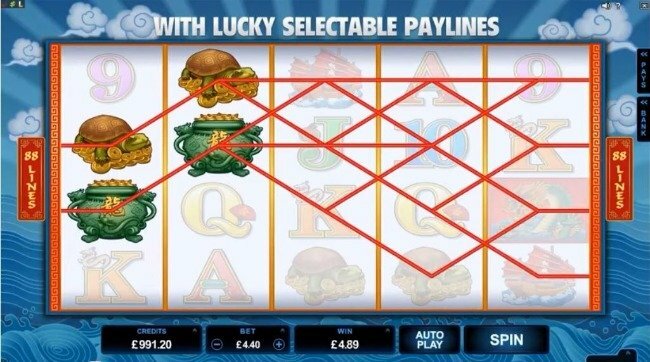 The number of lines you choose certainly affects your wagers. Coin values of 0.01 up to 0.25 can be selected, and players can wager up to 10 coins per line. Expect minimum bets of 0.38, 0.68, or 0.88 per spin, and maximum stakes which are capped at 95.00, 170.00, or 220.00 per spin, when playing with 38, 68, or 88 lines, respectively. The Emperor of the Sea jackpot is non-progressive in nature and is capped at 412,500 coins in total. This is pretty extravagant, even for a world renowned developer such as Microgaming. 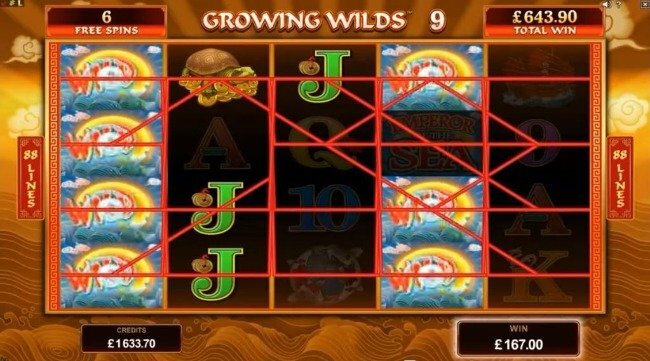 Wild symbols are just one of the Emperor of the Sea slot bonuses you can expect to find in this game. 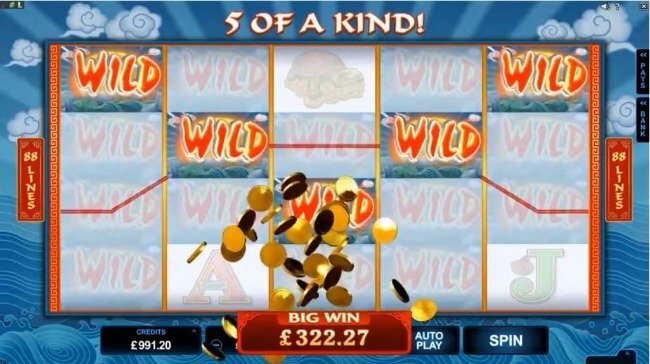 Wilds appear as the game’s logo and can substitute for all other symbols in the slot, save for free spin scatters. Wilds are stacked in the base game and are decent paying, but they are by no means the top paying symbols in the game. That honour goes to the scatters. Scatters appear as golden ingots, and they can trigger an Emperor of the Sea free spins bonus when 3 or more appear on the reels. Scattered wins will also be paid out with 3 or more symbols. The Emperor of the Sea bonus game consists of a free spins feature, and players will always start this feature with a total of 8 free spins under their belt. During the bonus round, Rolling Reels and Growing Wilds are present in the game, and wilds are stacked just like in the base game. Rolling Reels can see players able to land multipliers for consecutive wins, with winning symbols falling away and being replaced by new ones. The Growing Wilds feature can see wild stacks grow by 1 wild per spin, up to a maximum of 15 stacks. More of the same, or something new? The Emperor of the Sea slot machine is creative, and it certainly has features that players are going to find rather riveting. There is a big jackpot which makes the slot appealing, and the wagering system is original. We’re not a big fan of the imagery or the theme, though, as we’ve seen this all too many times for the theme of the Emperor of the Sea slot to stand out.